IGF-1 Muscle Building Spray has purest and unique deer antler velvet extract formula with L-Arginine, Epimedum, Tribulus and Eurycoma Longifolia. 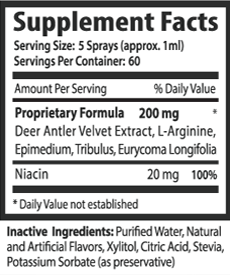 Deer Velvet Antler IGF product extracted directly from adolescent deer before their antlers turn to bone . 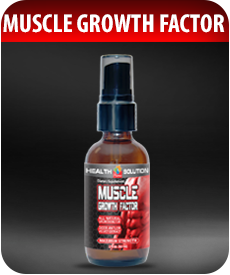 So when you use this extract to spray (squirt, to be exact), you are essentially adding insulin-like natural growth hormone that has the most efficient muscle building qualities. ​Besides its muscle-building (or muscle recovery) abilities, IFG-1 Spray greatly improves athletic performance and ultimately improves a person's health in general. In particular, it streamlines a person's immune system, thus helping maintain a healthy heart, fight off any potential illnesses, and even helps maintain proper sugar levels in blood. One of the primary benefits of IGF-1 is that it reduces fat WITHOUT any loss in muscle mass, which is critical when attempting to lose weight properly and effectively. Many people may not realize, however, our bodies regularly produce certain levels of IGF-1 on a daily basis - though simply not enough! It is that simple. Quite surprisingly also, we get a bit of IGF-1 even from drinking milk, though again, hardly enough to supplement our own natural hormone production. As a result, IGF-1 Muscle Building Spray from Vitamin Prime is the most efficient and easy-to-use solution to the issue, carefully and methodically infusing additional doses of entirely safe and natural IGF-1 into the system, thus maintaining healthy doses of the hormone in our bodies. ​Health Solution USA is a US-based direct-selling company that manufactures and markets tablets and encapsulated all-natural pure herbal products, high-quality natural vitamins, body-building products, food supplements, sports drinks, energy drinks and other complementary products. Health Solution USA has established a unique and substantial presence in the beverage industry with five brands under the trademarks of Coco Life, Coffee Life, Philly Iced Tea, and Aloe Vera Life. ​Our manufacturing capacities have expanded and we’re able to bring even more good things to you. As one of the most technologically advanced supplement manufacturers in the United States, we continue to push the boundaries forward on quality research, testing and introducing new ingredients. We offer over 300 premium nutritional and natural products, including single herbs and herbal extracts, homeopathic remedies, vitamins, minerals and specialty products.